[Image: A motif index for lost mines and treasures applied to redaction of Arizona legends, and to lost mine and treasure legends exterior to Arizona by Byrd Howell Granger]. Several lifetimes ago, I worked as a summer intern at the American Folklife Center down in Washington D.C., where, before my internship officially ended, I spent a few hours making loads of photocopies from a bunch of old papers, articles, pamphlets, self-published magazines, and various books about maps, mythology, folksong lyrics, and more. Even today, I keep finding these things filed away in various places. One of the more interesting things I took with me, and that I just stumbled upon again, was a project by Byrd Howell Granger. She was an absolutely fascinating woman who served as a commanding officer in the Women Air Force Service Pilots Squadron before later becoming a folklorist; she then flew all over Arizona studying place names and the local legends that led to them, meticulously documenting the geographic folklore of the U.S. southwest. There are a million possible things to write about Granger's life, but the one thing of hers I left D.C. with was a random sheaf of photocopied pages from a book exploring the folklore of "lost mines and treasures" in the west. The book includes a numbered list of lost treasure stories, explaining how gold bars, silver bullion, stolen Aztec jewels, and other "treasures" were left scattered throughout the landscape. The stories are concise, novelistic, and enticing, like a peculiarly Western variation on Félix Fénéon's Novels in Three Lines. [Image: An unrelated shot of a 19th-century silver mine in Michigan; via the Library of Congress]. "In the early days of the California missions some priests were transporting church treasure along a trail through the rough Graham Mountains," Howell writes. "A scout warned them that Apaches were coming. Hastily the padres hid the gold, money, jeweled church vessels and other things in a cave. In the ensuing battle, all but a few were killed. The survivors could not recall where the cave was." Or: "Between 1520 and 1541, many treasure-seeking Spaniards traveled through what is now Arizona. One group crossing northern Arizona transported much gold and silver. Pursued by Indians [sic] near what is now Flagstaff, the Spaniards buried their treasure and separated to save themselves. A few escaped. These handed down the legend of a treasure which still awaits recovery." Other times, these shortest of short stories read like a new comic by Mike Mignola: "Long ago at Tubac," we read, "maps to buried treasure were buried in a house. The place was abandoned and the maps forgotten. Then when Tubac became a part of Arizona, new people moved into the old house. Because of the way the moon caused one wall to glow, they believed that the house was haunted. They decided to remove the offending wall, and when they did they found an underground room containing a paper which crumbled to dust on exposure. The glow never reappeared." Howell's book breaks these stories down into "motifs," or oft-repeated narrative details (such as a band of attacking Apaches, a fleeing church group, a lost Frenchman, a handful of wandering children, etc. ), and then shows how these details are being constantly churned up and remixed from locality to locality to form new variations on the same basic storyline. It's how folklore is born. 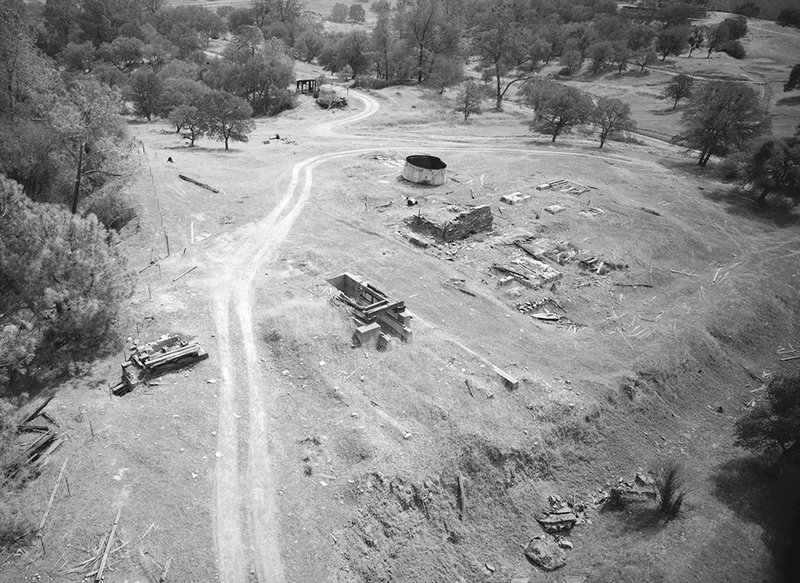 [Image: Otherwise unrelated shot of a gold mine in California; via the Library of Congress]. Briefly, I'll mention that the genre of the lost Western treasure pops up unexpectedly in a film called King of California, starring Michael Douglas. The film is not very good—so be forewarned, if you decide to watch it—but the premise is amazing. The short version of it is that Douglas, recently released from a psychiatric hospital, reveals to his daughter that he spent the last several years of his confinement researching the life of an old Spanish church father whose treasure—rumored to be buried in the same region north of Los Angeles where he and his daughter now live—has never been found. The landscape is now a sprawl of freeways, subdivisions, chain restaurants, golf courses, and big box stores, and it is amidst all this that Douglas embarks on what should have been an entertaining romp, tracking seasonal constellations, looking for inscriptions in old rocks, and performing detailed property surveys among the parking lots. He is looking for a lost river and a particular conjunction of stars—and he actually finds it. He locates the site of the Spanish treasure. The only problem is there's now a Costco built on top of it. 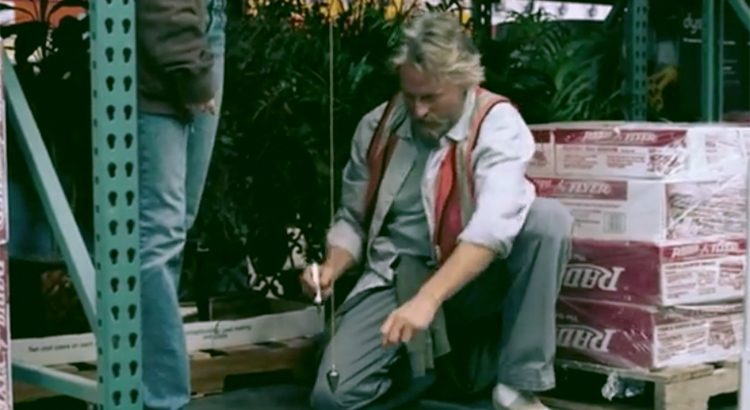 [Image: Michael Douglas measures out the exact spot of the buried treasure, near some potted plants in Costco; from King of California]. Undaunted, Douglas hauls his surveying gear deep into the store and manages to measure out the precise spot where he needs to dig, beneath some large home appliances. Now all he has to do is come back and break into the store at night, hammer down through the concrete floor, uncover the buried river, and then swim downstream toward the Spaniard's buried treasure. Simple. [Image: The lost river uncovered, Douglas prepares to jump in; from King of California]. It's an absurd but brilliant premise, and it is unfortunately marred by almost everything else about the film. However, I mention it here because it sounds like something straight out of Byrd Howell Granger's book: emotionally disturbed suburbanites convinced that, amongst all the concrete and imported palm trees, beneath the cars and swimming pools, there must be some sort of buried treasure, some great and lost thing that can redeem all this, making their lives of unbearable mundanity finally worthwhile.